What entities can be turned into classes? Services are for framework logic, not business logic. How does my methodology work? - How do you read from multiple tables? - How do you write to multiple tables? - How do you deal with relationships? I'm guessing most of us heard that inheritance is for is-a relationships and composition is for has-a relationships one time or another. In Java 101: Inheritance in Java, Part 1 you learned how to leverage inheritance for code reuse, by establishing is-a relationships between classes. This free Java 101 primer focuses on composition, a closely related programming technique that is used to establish has-a relationships instead. Code should be readable so that it can be understood and maintained by others as well as yourself. Keep It Simple, Stupid - which taught me to avoid the use of "clever" code when a simpler alternative was available. Don't Repeat yourself - which taught me to build libraries of reusable code instead of having copies of that code existing in multiple places. These libraries quickly grew into fully-fledged frameworks which boosted programmer productivity. If it ain't broke then don't fix it. The idea that you should keep refactoring working code just to use the latest whiz-bang that has been added to the language is something that does not fly in the real world. Jackson Structured Programming - which taught me that the most important thing in a database application is the design of the database, after which the software should be written to match the database structure. Most of this experience was spent working for software houses where we had to respond to a customer's Specification Of Requirements (SOR) with an outline design as well as cost and time estimates. When we won the business we then had to deliver the goods, and I can honestly say that none of the systems that I designed and built ever failed, nor did any go over budget or over time (at least, not by a significant amount). Having designed and built many systems in several non-OO languages using hierarchical, network and relational databases I became quite proficient at data analysis and data normalisation. Building one new system after another also taught me the value of building code libraries which could be used in multiple applications. Over a period of time these libraries morphed into full-blown frameworks, the first of which I wrote in COBOL which I later rewrote in UNIFACE and then PHP. Later versions of various OO languages have added more features, and some people seem to think that it is these additional features which decide if a language is OO or not. I totally disagree for the reasons stated in What OOP is Not, as well as this list of optional OO features for which I have found no use. It would be like saying that a car is not a car unless it has climate control and satnav. Those are optional extras, not the distinguishing features, and not using them does not make your code not OO. It would also be incorrect to say that a car is a car because it has wheels. Having wheels does not make something a car - a pram has wheels, but that does not make it a car, so having wheels is not a distinguishing feature. All the entities in the business/domain layer are database tables, so I have a separate class for each table. Encapsulation The act of placing an entity's data and the operations that perform on that data in the same class. The class then becomes the 'capsule' or container for both the data and the operations. All the Model classes in the business/domain layer are database tables, so in my approach each concrete table class inherits from an abstract table class. Polymorphism Same interface, different implementation. The ability to substitute one class for another. This means that different classes may contain the same method signatures, but the result which is returned by a particular method will be different as the code behind that method (the implementation) is different in each class. Each of my 40 reusable Controllers interacts with the 300+ business/domain layer (Model) classes via methods defined in the abstract table class, which means that any Controller can access any Model. Each Controller contains a particular set of method calls on an unknown Model, and the results of each method call varies from one Model to another. The identity of the Model is not hard-coded into any Controller, it is passed to it at runtime using a mechanism known as Dependency Injection. Some programmers try to claim that PHP is not an OO language, but as even PHP4 met the requirements that were identified by the man who invented the term I consider this claim to have zero merit. OOP requires the definition of classes which can be turned into objects at runtime. The first problem is therefore identifying those entities with which your application is expected to communicate. Entities - An Entity's job is also mainly holding state and associated behavior. Entities differ from Value Objects in that an Entity does have an identity separate from its contents. Examples of Entities could be Account or User. Services - A Service performs an operation. It encapsulates an activity but has no encapsulated state (that is, it is stateless). Examples of Services could include a parser, an authenticator and a validator. Services are normally provided by the framework and do not have to be built by the developer. Value objects - A Value Object is an immutable object whose responsibility is mainly holding state but may have some behavior. A Value Object has no conceptual identity separate from its attributes. Example of Value Objects might be Color and Temperature. PHP does not use value objects as every class property is a scalar, or perhaps an array, so I ignore these completely. The classes which are the main topic of this article are those which contain the business logic of the application and which reside in what can be called the Business layer, the Domain layer or the Model layer. The components in the other layers will be discussed later on. One of the big selling points of OOP is that you can model the real world! , but a lot of developers fail to realise that you do not model the whole of the real world, only those parts in which you are actually interested. Different entities in the real world may have exotic sets of methods (also known as operations, functions or actions) and properties (also known as attributes, variables or data), but you need only create software models which contain those methods and properties which are actually relevant to your application. This brings me to my next point. 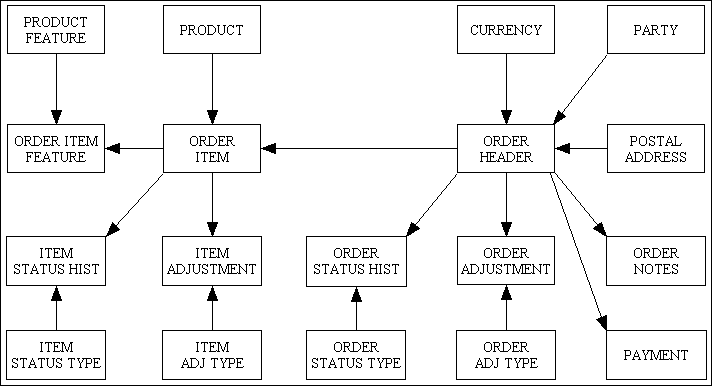 You may be building an Order Processing application that deals with entities such as Customers, Products and Sales Orders, so the novice designer will start by making a list of all the methods and properties of people (who are customers), products (the items being sold) and sales orders (agreements to purchase). IMHO this is a BIG mistake. A Person, for example, may have methods such as "stand", "sit", "walk" and "run" and properties such as "blue eyes", "brown hair", "6 foot tall" and "weighs 12 stone" but none of these have ever been relevant in any Order Processing application that I have written. They usually restrict themselves to "name", "postal address" and "email address". Similarly different physical products may have oodles of methods and properties which are totally ignored except for "identity", "description" and "price". When it comes to Sales Orders, these never exist physically in the real world. In pre-computer days all sales orders were filled out on paper, but nowadays sales orders are rarely printed, if ever. They are merely stored as bits and bytes in a computer system. I understand the point of reusing code to generate SELECT/INSERT/UPDATE/DELETE statements, but you can do that without having to create a class for every table you have. Say I wanted to talk to the table 'cars'. I'd compose an object by creating an instance of a Table class and add rules represented as objects to it. I think that if you ask some good designers they will tell you that an approach which uses instances of a single Table class is better than one which requires the declaration of a new class for each new table. Each database table has its own data structure and its own methods, therefore surely qualifies for its own class. The idea of having an empty table class into which I can later inject the data structure, the business rules and the methods seems to me to be an overly complex way of doing such a simple thing - I would have to hold the data structure, business rules and methods somewhere in the application before I could inject them into an empty table object in order to make a usable object. By making this somewhere a class which inherits from the abstract/empty class I don't have to inject anything anywhere - all I have to do is instantiate this somewhere class and I instantly have a usable object without the need for any extra code to perform the injection. Also, if you look at the definition of a class you will see that it says A class is a blueprint, or prototype, that defines the variables and the methods common to all objects (entities) of a certain kind. If you look at the DDL for a database table then surely this qualifies as the "blueprint" for every record that will be written to that table? That is precisely why I have an abstract table class which specifies the methods and properties for an unspecified database table, and a separate concrete class for each actual database table which inherits from this abstract class. My main application has over 300 tables, so that's a lot of inheritance. Why on earth should it be more complicated than that? Surely all I am doing is following the KISS principle. There is nothing inherently wrong with this, just as there is nothing inherently right about making things more complicated than they need be. I have been building database applications for the enterprise for several decades in several languages, and I have personally designed and built many thousands of user transactions. No matter how complex an individual transaction may be, it always involves performing one or more CRUD operations on one or more database tables. All I have done is adapt my procedural programming method to encapsulate the knowledge of each database table in its own class, then use inheritance and polymorphism to increase code reuse and decrease code maintenance. This is supposed to be what OOP is all about, so how can I be wrong? In addition, because my class structures and database structures are always kept in sync I do not have any mapping code or any mapping problems. In computer science, object composition (not to be confused with function composition) is a way to combine simple objects or data types into more complex ones. In this example the calling object, which is usually a controller in the MVC design pattern, cannot access either the Contact or Engagement data without going through the Company object. This means that the controller must first instantiate an instance of Company which then itself instantiates instances of both Contact and Engagement. It then has to call a method on the Company object to get the data it wants, which implies that there must be separate methods for accessing Company data, Contact data and Engagement data. This whole design perplexes me. This is not something that I would ever have dreamt up myself as the SQL language allows me to access a table directly without having to go through another table. It does not matter how many parent or child relations exist for a table, I can always access that table without referring to any of its parents or children. Although it is possible to have different use cases which access particular combinations of tables in particular ways, it is surely a function of the use case to identify which combination is actually required, and to be able to access each table in a polymorphic manner. The idea of object composition strikes me as being a clear violation of the KISS principle. When I first heard about this idea and read its details the first thought that ran through my mind was Who dreamt up this pile of poo? As a developer with decades of experience in the design and building of database applications I therefore choose to follow the Table Oriented Programming approach instead of that abomination called Object Oriented Design. It does not matter how many relationships a table has as it can be accessed directly without being forced to go through any of its parents. There are only four basic operations which can be performed on a database table - Create (via INSERT), Read (via SELECT), Update and Delete - which gives rise to the CRUD acronym. Although each of these operations can only work on a single table, the SELECT statement can be extended to retrieve data from multiple tables by using relational JOINs which make use of foreign keys. I am ignoring the fact that you can use database views to treat a group of tables as a single entity. A table can have a number of different parents, so which of the parent objects would you use to access that child object? The article Increasing complexity one entity at a time, at the section titled Fixing the problem (1st solution), suggests creating a separate class for each combination of parent table and child table, but this is another idea that doesn't float in my world. A parent table can have any number of different children, and as the number grows the parent object could become more and more unwieldy. Many years ago I read a post in a newsgroup where a developer complained that his code was very slow. He had built an application for a school which dealt with entities such as Classroom, Teacher and Student. It also had Subject which was subdivided into Lessons, and Schedule which is an instance of a Teacher giving a Lesson to a group of Students in a particular Classroom on a particular date and time. Following the rules of object composition he had created a School class which had properties for each of these "has-a" entities. When he instantiated the School object this read everything from the database in order to populate each of these child objects. When the volume of data was quite small it ran reasonably quickly, but as he added more and more data it got slower and slower, and he couldn't understand why. His complaint to the newsgroup was I have followed the rules concerning object composition, so why is my software so slow? The first thing he did wrong was to use object composition. The second thing that he did wrong was to implement it badly. The idea that you should read all your data into a single object just in case it is needed is not a good idea. Those of us with practical experience know that you only read the data that you need when you actually need it. This philosophy is known as just in time. I actually wrote my own version of a Classroom Scheduling system way back in 2004 which has exactly the same entities but does not have any performance problems. You can run this code now for yourself by visiting the RADICORE demonstration page, logging on as "demo" and selecting the PROTO menu followed by the CLASSROOM option. This works because I don't use object composition and can access each table's class without going through a parent class, and because each user transaction only reads that data from the database that it actually needs in order to service the current request. He follows the rules and creates crap software. I disobey the rules and create good software. What does this tell you about those rules? I am quite familiar with, and totally agree with, the idea that once you have identified an entity (something which has properties and methods) that needs to be accessed in your application then you should create a class which encapsulates the properties and methods of that entity. Note that this means ALL the properties and ALL the methods of that entity should go into a SINGLE class. The idea that you should split some of these methods or properties off into separate and smaller classes simply because the count exceeds an arbitrary number is an idea that never occurred to me, and now that I know that it exists I am quite happy to ignore it. However, where one of those properties is so complex that it goes beyond being a single value and requires its own table in the database, then I treat that property as a totally separate entity which requires its own independent class. Figure 6 shows a small ERD, but in a large enterprise application the number of tables and relationships can be much, much larger. 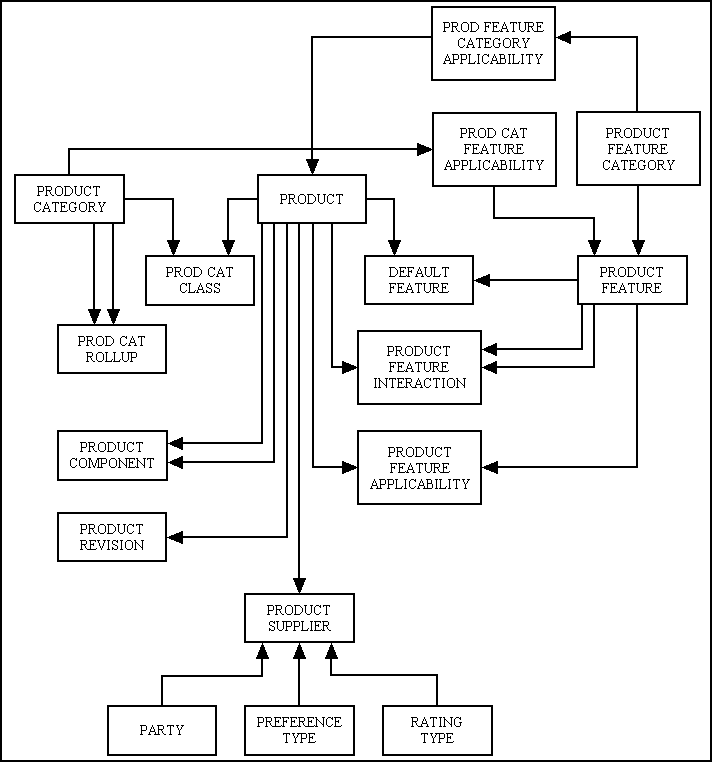 My own ERP application, for example, is based on the database designs which can be found in Len Silverston's Data Model Resource Book. A diagram of a subset of the PARTY database is shown in Figure 7, the PRODUCT database is shown in Figure 8, and the ORDER database is shown in Figure 9. Note that this design caters for organisations as well as people, and customers as well as suppliers. As you should see there is a relationship between the PARTY table and the PRODUCT table via the PRODUCT_SUPPLIER table, so should this be a child in the PARTY class or the PRODUCT class? Should I have a different version of the PRODUCT_SUPPLIER class for each of its parents? As you can see it is just not possible to have a single table for CUSTOMER, PRODUCT and ORDER. They each require such a diverse collection of data that, following the rules of Data Normalisation, they actually require a large collection of tables, large enough to warrant an entire database to themselves. Just as you would not put all that data into a single table I do not see why you should put all the programming logic for those tables into a single class. Each table has its own schema, its own blueprint, its own business rules, so as far as I am concerned it qualifies for its own class. That is the basis on which I built my RADICORE framework in 2002, and as it has worked out so well I see no reason to change it. By coincidence this actually conforms to the idea that with OOD you use inheritance for each "is-a" relationship. As each of my entities is a database table it therefore inherits from my abstract table class. You have to change the class which deals with the parent table to include methods to access the child table in different ways. You have to change the controller which accesses the parent table so that it can reference these new methods. Cohesion describes the contents of a module, the degree to which the responsibilities of a single module/component form a meaningful unit, and the degree of interaction within a module. It is a measure of the strength of association or the functional relatedness of the elements inside a module. Modules with high cohesion are preferable because high cohesion is associated with desirable traits such as robustness, reliability, reusability, extendability, and understandability whereas low cohesion is associated with undesirable traits such as being difficult to maintain, difficult to test, difficult to reuse, difficult to extend, and even difficult to understand. For example, in my framework I have separate View components which formats application data into HTML, PDF and CSV. Each format requires processing which totally unconnected with that required for the other formats, so it makes sense to keep the code for each format in its own class. Having a separate class for each database table, and to be able to access that class without having to go through another class, means that each class is limited to the business rules of a single table. Mixing the business rules for several tables in a single class is a practice that I have learned to avoid. Each table is a separate entity in the database, so it should be a separate entity in the software and it should be able to be accessed as a separate entity. This allows to value of $table_id to be set to any table in the database, and the method call will then perform that operation on that table. In my framework I have 40 controllers, one for each Transaction Pattern, that can be used with any Model class in the Business layer by virtue of the fact that the method names are defined in the abstract class which is inherited by each Model class. As my main enterprise application has 300 database tables, this provides the opportunity for 12,000 (300 x 40) polymorphic combinations. If your methodology does not provide that level of reusability then I would strongly suggest that you re-evaluate your methodology as it is failing to deliver what OOP was supposed to deliver. Another idea which I came across several years after building my framework is that when implementing the MVC design pattern you are supposed to have a separate Controller class for each Model class, and this this single Controller is supposed to be able to deal with every possible Use Case. a list of action or event steps, typically defining the interactions between a role/actor and a system, to achieve a goal. In my universe, which existed before this term was invented, these things called "use cases" were known as "transactions" within a Transaction Processing System. This was later changed to User Transaction or Business Transaction in order to differentiate it from a Database Transaction as some user transactions do not actually involve updating the database, so using a COMMIT/ROLLBACK would not be relevant. In my RADICORE framework the term "user transactions" has been shortened to task, and each task, which performs one of the LIST, SEARCH, INSERT, ENQUIRE, UPDATE or DELETE operations shown in Figure 10, can be selected by a user either from a menu button or a navigation button. Each task has its own component script in the file system which identifies which Model, View and Controller to use. 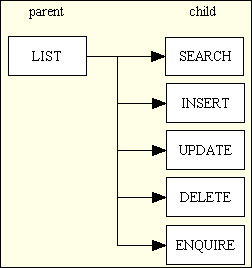 Some people create complex use cases by combining several separate operations into one, such as "show a SEARCH screen where the user can enter filters, then show a LIST screen displaying the records which match those filters, allow the user to select a record and then show an ENQUIRE screen which displays all the details for that record". Each of the SEARCH, LIST and ENQUIRE screens should be developed as separate transactions which can be run one after the other in any combination. The idea of predefining which combinations are allowed, and having a separate use case for each combination, is an alien concept to me. The idea of having a single controller which can handle multiple operations is also an idea which I shot down in flames several decades ago. Each operation requires its own pieces of program logic, therefore in order to execute a single operation the controller must contain additional code which identifies which pieces of code need to be included or excluded for that particular operation. Problems arise when a piece of code gets executed when it should not, or does not get executed when it should. This becomes a bigger problem when you try to introduce Role Based Access Control in order to limit particular operations to particular users. I solved this problem in 1985 when I built my first development framework in COBOL by having each user transaction (use case) developed as a separate piece of code which had its own entry on the M-TRAN table in the database. Each user had an entry on the M-USER table, and a particular user could only access a particular transaction if there was a corresponding entry on the D-TRAN-USER table. This meant that there was no need for any code inside a transaction which checked to see if a particular user could or could not access a piece of logic as the checking could now be performed by the framework before the transaction was run and not after it had started. Each transaction was activated by pressing a button on a screen, and the framework was programmed not to display those buttons for which the current user did not have access. If the user could not see the button to activate a transaction then he could not run that transaction. How simple is that? I then decided to make multiple calls from my pages. If a page needed a company, a list of contacts and a list of engagements related to that company, I would make three calls from the page. This decision made all the "read" objects go away and still kept my code very simple. If he says it's OK then how can it possibly be wrong? In What entities can be turned into classes? I identified two categories for objects - entities (domain objects) and services. The main difference between the two is that entities have state which can persist while services do not. What logic belongs in a Domain object? What logic belongs in a Service object? As far as I am concerned any business logic which is specific to a single entity belongs in the class which represents that entity, and these classes belong in the Domain/Business layer. This, after all, is what encapsulation is all about. However, in any application there will be some logic that will need to be performed on the data for many entities, not just a specific entity, and it is this logic that can safely be put into separate service objects. In order to put this idea into practice you must start with a multi-layer architecture. 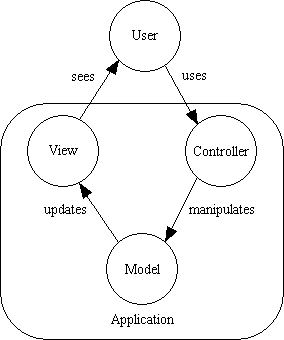 My own framework for example, is a combination of the 3-Tier Architecture and the MVC Design Pattern as it contains Models, Views, Controllers and Data Access Objects. They exist in the Business/Domain layer and encapsulate all the business logic for each of the entities which are used within the application. The classes for these entities are generated by the application developer from the table definitions within the application database. They exist in the Presentation/UI layer and turn requests from the user into actions which are performed on one or more objects in the Business/Domain layer. Each of these has been written to work with any domain object, not just a single specific object, which makes them infinitely reusable. As such they are supplied within the framework and do not have to be touched by the developer. They exist in the Presentation/UI layer and transform the raw data produced by objects in the Business/Domain layer into the format desired by the user, with different objects for HTML (using reusable XSL stylesheets), CSV and PDF output. They can do this by extracting the object's data in a single array variable, and then iterate through this array one row and one column at a time, which means that they do not need to contain any hard-coded column names. Each of these has been written to work with any domain object, not just a single specific object, which makes them infinitely reusable. As such they are supplied within the framework and do not have to be touched by the developer. Data Access Objects (DAO) are services. They exist in the Data Access layer and translate requests from a domain object into SQL queries which are executed on a particular DBMS engine, with separate classes for MySQL, PostgreSQL, Oracle and SQL Server. They do not contain any hard-coded table or column names so can operate on any table in the database. As such they are supplied within the framework and do not have to be touched by the developer. All application logic is contained within the Domain/Business layer in the form of Model classes which are generated by the developer with the help of the Data Dictionary. All Views, Controllers and DAOs are application-agnostic as they do not contain any application logic, only general-purpose framework logic. They are supplied within the framework, can work with any domain object, and do not have to be touched by the developer, therefore can be regarded as services. I am often asked the question I have been taught that there is only one way to do OO, and you are not following that way, so how can it possibly work? . When I explain that I design my database first and then build the software around the database design, as taught in the Jackson Structured Programming course I attended decades ago, I am then told But that's not how it's supposed to be done! One indignant OO "expert" went so far as to tell me I tried that approach once, and I couldn't get it to work . That just tells me that his implementation was seriously flawed, and if he cannot achieve what generations of programmers have been doing for decades, then what does that say about his programming skills? I had been writing database applications in several non-OO languages for several decades before I switched to PHP and its OO capabilities in 2002, so I wanted to continue doing what had worked successfully till then, but to take advantage of encapsulation, inheritance and polymorphism in order to increase code reuse and decrease maintenance. This, after all, is supposed to be what OO is all about. It is only after writing large numbers of programs which maintain the contents of large numbers of database tables that you begin to see patterns emerging, and it is the ability to turn these patterns into reusable code which is the mark of a good programmer. But when do these patterns start to emerge? LIST - list multiple rows from that database table, with the ability to scroll through the rows one page at a time. SEARCH - show a screen containing empty fields into which the user can type search criteria. Pressing the ENTER key will return to the LIST screen which then refreshes itself using that criteria. INSERT - show a screen containing empty fields into which the user can type new values. Pressing the ENTER key will add that record to the database before returning to the LIST screen which will refresh itself. UPDATE - show a screen containing current values for the selected record and allow the user to change any values. Pressing the ENTER key will update that record in the database before returning to the LIST screen which will refresh itself. DELETE - show a screen containing current values for the selected record. Pressing the ENTER key will delete that record before returning to the LIST screen which will refresh itself. ENQUIRE - show a screen containing current values for the selected record. The ENTER key does nothing as this function does not update the database. LIST - this shows multiple rows going horizontally across the page, one line per row, with column headings on the first line. DETAIL - this shows a single record vertically down the page with column names on the left and column values on the right. ES (External Schema) for user views. PS (Physical Schema) which defined the physical storage structures. CS (Conceptual Schema) which was was a representation of the Physical Schema. The Physical Schema was handled by a built-in database driver which connected the UNIFACE application to a particular DBMS at runtime. This allowed an application to be developed using one DBMS and deployed using another. 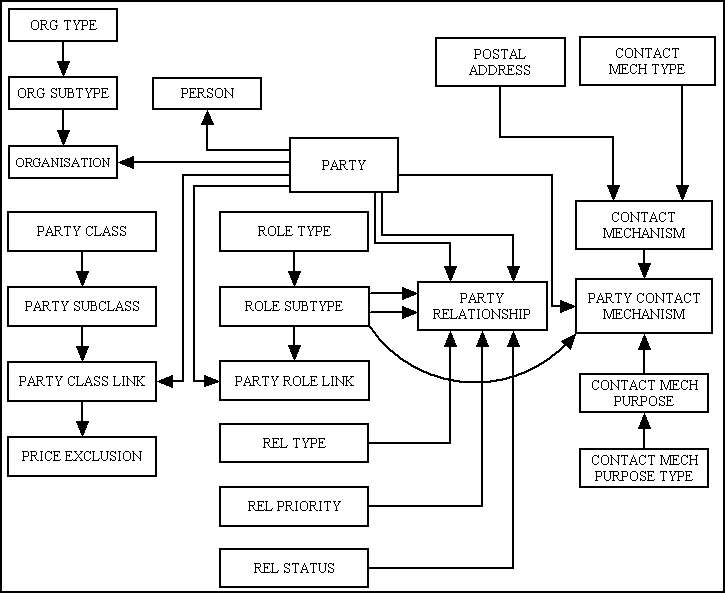 The Conceptual Schema was an internal database known as the Application Model or Repository which contained information on entities (tables), fields, keys (indexes) and relationships, together with referential integrity, for the application database. Each entity and field in the model had properties and a set of triggers, which were containers for Proc code (Uniface's procedural language). Application databases were first defined in the Conceptual Schema and then exported to the DBMS-of-the-day by means of a CREATE TABLE script. Components were created by embedding objects from the Application Model into the layout canvas. This would start with rectangle called an entity frame which was linked to a particular entity into which other objects, either fields from that entity or another related entity, could then be painted. At runtime the user would press a button to fire the "read" trigger and this would read a record from the database and populate the fields in the screen. This would start at the outermost entity and work its way inwards one entity at a time. This is why in those Transaction Patterns which deal with more than one database table I use terms such as "outer" and "inner" entity. The main advantage of this language was that you could develop an application for one OS and DBMS and then deploy it on a completely different OS and DBMS. Another advantage was that developers never had to write any SQL queries as they were generated automatically at runtime by whatever database driver had been configured. This also had a big disadvantage - it was impossible to write complex queries or to use JOINs. 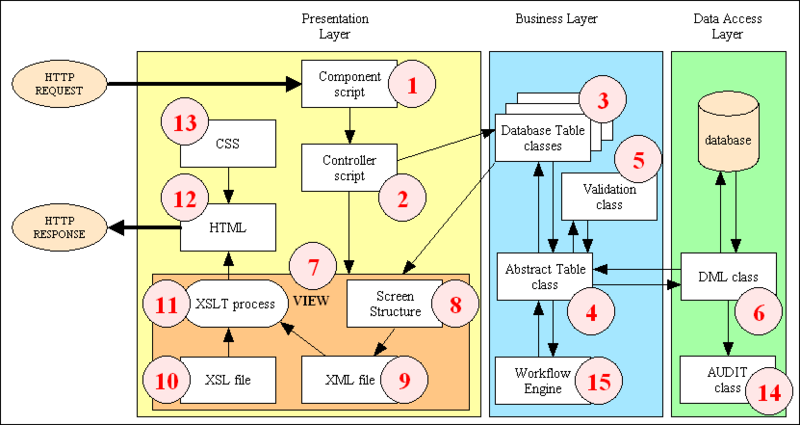 The Presentation layer (External Schema) was split into Forms, Reports and Web Pages. The Business layer (Conceptual Schema) was split into Entity Services and Session Services. The Data Access layer (Physical Schema) remained as a separate driver for each DBMS. I also learned about XML documents, XSL transformations and component templates. UNIFACE was initially developed for client/server applications, but the facility to deal with web pages was added on later. I felt that the mechanism for building web pages was far too cumbersome (the use of XSL transformations did not include the ability to create HTML output) so I decided to switch to a more appropriate language. I chose PHP. I started to teach myself how to program with PHP in 2002. This was with PHP4 as PHP5 did not exist at that time. As I had already written successful frameworks in both COBOL and UNIFACE I started with the database design, then built the components to maintain each of its tables. I did not use Object Oriented Design (OOD) as I did not agree with its "is-a" and "has-a" approach for dealing with relations. I also did not like the idea of using an alien technique for designing my software structure as it totally contradicted what I had learned in Jackson Structured Programming and had used successfully for decades. The very idea of being forced to use an Object Relational Mapper filled me with horror. I chose to use the 3-Tier Architecture as I liked the way it split the program logic into separate layers. I started by building a class in the Business layer for the first table, then a script in the Presentation layer which translated requests from the user into method calls on that class. As I had already proved to myself that PHP could adequately produce XML files and perform XSL transformations I decided to produce all HTML in this way. It was several years later on when a colleague pointed out that what I had actually developed was an implementation of the MVC design pattern. That is why I tell people that I did not not use that pattern by design but by accident. The table structure, which included a list of column names, their properties, and any relationships with other tables. Because I was dealing with database tables, and there are only four basic operations which can be performed on a database table - create read, update and delete - I initially built only four methods into my abstract table class, which were insertRecord(), getData(), updateRecord() and deleteRecord(). All the default code for dealing with these methods was built into the abstract class, but I interrupted this processing flow with a series of blank customisable methods which could be copied into the concrete class and then filled with code so that the default behaviour could be overridden. I did not like the idea of defining each database column as a separate property in the class so I stuck with a single $fieldarray variable which holds the data in an associative array. I find it much easier to pass the data between different objects in a single variable, either as an argument on the method call or its return value. I can therefore adjust the contents of the array without adjusting the coupling between objects, which provides for loose coupling which is supposed to be better than tight coupling. This means that I can add or remove columns for individual use cases at will, which includes the use of JOIN clauses which add columns from other tables. This associative array can also be turned into a multi-dimensional array in order to hold data for multiple rows by using the row number as the key at the first level. Because of the way I had written my page controllers the only difference between them was the name of the table class, so I split each controller into two separate parts - a component script which identifies which table class to use, and a reusable controller script which performs operations on that table. This is a technique which I later learned was called Dependency Injection. In my original implementation I used a separate custom-built XSL stylesheet for each screen into which all column names and the HTML controls which they were to use were hard-coded. By refactoring this code I found a way of inserting the column names and their controls into the XML document so that I only needed a very small set of reusable XSL stylesheets which could then deal with any screen in the application. This is done by creating a simple screen structure file which is copied into the XML document and then used by the XSL stylesheet to work out which piece of data goes where. This meant that the form structure shown in Figure 10 could be implemented using a single stylesheet for all LIST forms and a single stylesheet for all child/DETAIL forms. Uniface had a feature called Component Templates which I converted into Transaction Patterns. Several programmers have told me that these patterns do not exist because nobody famous has ever written about them. This just tells me that their ability to recognise patterns or recurring themes is sadly lacking. They will pontificate wildly about design patterns while failing to realise that they do not actually provide reusable code, only designs which then have to be coded by hand. My Transaction Patterns are genuine patterns because it is possible to say "Take this object, that pattern, and generate a new component". In my original implementation I had all SQL queries generated within the abstract class, but then I moved them to a separate object so that I could easily switch to another DBMS. This was useful when it came to handle the switch from the old mysql extension to the new "improved" extension when MySQL version 4.1 was released in 2003. I later added classes to deal with PostgreSQL, Oracle and SQL Server. In my original implementation I created all the table class files by hand, but then I created a Data Dictionary to do this for me. Unlike the Application Model in UNIFACE, which was maintained by the developer and then exported to the database by generating a CREATE TABLE script, my version works in the opposite direction. The database structure is created manually, then imported into the dictionary, then exported to create the table class file and a separate structure file. I made these files separate so that the structure file could be regenerated while the class file would be untouched in case it had been customised. In my original implementation I created the component scripts and screen structure scripts manually, and also added the component details to the MENU database manually, but I later modified my Data Dictionary to do this job for me using my library of Transaction Patterns. This depends on the structure of the particular screen or form. Each screen can be split into several distinct areas which contain specific pieces of data, some of it provided by the framework and some of it from the application database. The area for application data may be subdivided into different zones for different entities. A LIST1 pattern uses a single application zone, as does an ADD1, ENQUIRE1, UPDATE1, DELETE1 and SEARCH1. The LIST2 and MULTI2 patterns use two zones, an outer/parent and an inner/child, whereas the LIST3 and MULTI3 patterns use three zones. The "N+1" problem involves reading from two tables which exist in a parent-child relationship. In the case of starting with the "child" and including a column from the "parent", the "1" is the query which reads from the "child" table and the "N" is one query for each parent table for each row in the "child" table. If the 1st query reads 10 rows from "child" you will then need an additional 10 queries to read the "parent" of each of those "child" rows. If the child has more than 1 parent this will require 10 additional queries for each parent. In the case of populating one area with one row from the "parent" and populating a second area with multiple rows from the "child", some OR mappers will perform one query for the parent and a separate query for each row of the child. In order to include data from multiple tables in a single zone, eg. from "child" to "parent", the preferred approach is to use JOIN clauses in the SQL query. It is possible to get the framework to construct this type of query for you provided that the relevant information has been provided on the parent relationships. The controller will execute $parent->getData($where). This may retrieve multiple rows depending on the contents of $where, but it will only return a single row at a time due to LIMIT being set to 1. If more rows are available a scroll bar will be made available in order to step through the other rows. The framework will then extract the primary key for the current row for $parent and place it in the $child_where string. The controller will execute $child->getData($child_where). The number of rows returned will depend on the current page size. If more rows are available a pagination bar will be made available in order to step through the other rows. Note that each class, thanks to its own version of $fieldspec, knows which fields are valid for its database table, so will ignore any data in its $fieldarray or $rowdata array. This also means that when passing the data to the $other object it is not necessary to filter the data. Nor is it necessary to pass the data one field at a time as everything is always passed around in a single array. Relationships can only be expressed between two tables as a parent-child or one-to-many relationship. This requires one or more columns on the child table to refer to the primary key columns on the parent table. Note that some DBMS engines allow a candidate key to be used instead of the primary key. The columns on the child table are then known as a foreign key. This means that the child table can only ever refer to one row on the parent table, but the parent table can have any number of related rows on the child table. Note that it is not necessary to define a foreign key constraint before columns can be used as a foreign key. JOIN clauses in a SELECT statement do not reference any of these constraints. All relationships are defined in the Data Dictionary and, when exported, will populate both the $parent_relations and $child_relations arrays in the table structure file. The $parent_relations array will be examined when constructing SELECT queries in case any JOIN clauses are required. If set to RESTRICTED the delete operation will not be allowed to proceed. An error message will identify the relevant child table. If set to CASCADE the delete operation, when confirmed, will cause all associated rows on the child table to be deleted before the row on the parent table is deleted. I DO follow rules, but they happen to be a different set of rules from those that they follow. There is no such thing as a single set of rules which has been universally accepted by every programmer on the planet as the only set of rules that is allowed to exist, nor will there ever be. I DO NOT write software to impress other programmers with how clever I can be. I write it to impress my customers, the people who pay my wages, by producing cost-effective solutions to their problems. I write code in order to produce results, not to follow a bunch of artificial and arbitrary rules. I am a pragmatist, not a dogmatist. Perhaps this is why I don't create software which turns out to be a dog's dinner. Below is a list of rules that I have been told that I should follow, and against each one I explain why I don't. You may notice that there is one exception, but my interpretation of that rule is often regarded as the "wrong" interpretation. Ask me if I care! 1 Use OOD first to design your software structure, and leave the database design to last. NO! Design the database first and create a separate class for each database table. This completely removes the need for OOD. 2 Use "is-a" relationships for inheritance. YES! Every entity is a database table, so every class inherits from an abstract table class. The idea that you should create a Customer class which inherits from a Person class simply because a customer "is-a" person does not wash in my designs. I build large enterprise applications which deal with Parties who may be either people or organisations and each party may be a customer or a supplier, or even both, or perhaps neither. The attributes Customer and Supplier are defined on the ROLE table, and can be attached to a PARTY via the PARTY_ROLE_LINK table. 3 Use "has-a" relationships for object composition. NO! If a property of a class turns out to be more complex than a single value and requires its own table in the database, then it is treated as a separate entity with its own class. The idea that you should create a complex class just because some of its properties exist on their own database tables is a clear violation of the KISS principle. I would rather have a simple class for each database table than a complex class for a group of tables. 4 Design complex class hierarchies which can be several layers deep. NO! There are no hierarchies with database tables (except where implied through foreign keys) so there are no equivalent inheritance hierarchies with any table classes. The ONLY inheritance is from the abstract table class to each concrete table class. 5 Use lots of design patterns, the more the merrier! NO! Design patterns do not provide reusable code, only reusable designs which still have to be coded by hand, and which can be implemented in an infinite variety of ways. I prefer to use Transaction Patterns which DO actually provide pre-written and reusable code. A class file which contains the validation and business rules. A structure file which identifies the table's columns and their specifications. Note that if the table's structure changes it can be re-imported into the Data Dictionary, and the export process will only overwrite the structure file so as not to interfere with any customisations which may exist in the class file. 7 Create each Controller by hand. NO! Each Transaction Pattern has its own controller script which is built into the framework. 8 Create a single super-Controller for each Model which can handle all the use cases for that Model. NO! Each use case has its own unique component script which shares one of my 40 controller scripts, but each Model can be used by any number of Controllers and Views. 9 Create each View by hand. NO! Components are already built into the framework to format the application data into either HTML, PDF or CSV. All HTML output is produced from a library of 12 reusable XSL stylesheets. 10 Create a method in the class for each Use Case. NO! In the real world each use case is actually satisfied by performing one or more operations (Create, Read, Update, Delete) on one or more database tables, so the User Transaction which implements a use case need do nothing more than specify which operations on which database tables. Methods such as invoice->pay() should therefore be implemented as payment->insertRecord(). 11 Create a separate finder method for each different set of data that you want the class to return, as shown in the Table Data Gateway and Row Data Gateway patterns. NO! The SQL language does not require separate methods, it simply uses a SELECT ... WHERE ... which may be augmented with the addition of LIMIT ... OFFSET ... (or their equivalent). That is why my framework needs nothing more than a single generic getData($where) method which is defined in the abstract class. There are separate methods to set values for LIMIT and OFFSET. The other parts of the SELECT statement can be specified by custom code in each class. 12 A Controller can only ever access a single Model. NO! An HTML screen can contain one or more areas (or zones) of application data, and each of these areas contains data from a specific database table. In order to use independent CRUD operations on each of these tables the Controller must be able to access each table class independently. 13 Each column in the table must have its own property in the class. NO! Those who understand how relational databases and the Structured Query Language (SQL) works will know that they deal with rows or sets of data, and the number of columns which can be returned from a SELECT statement can be infinitely variable, especially when JOINS are used to connect to other tables. I find it much easier to use a single property called $fieldarray which can hold any number of columns from any number of rows in a plain PHP array. It is just as easy to reference a column using $this->fieldarray['column'] as it is with $this->column. 14 Each column in the table must have its own GETTER and SETTER methods. NO! By using a single property called $fieldarray I can hold an infinite number of columns and an infinite number of rows in a single variable, a plain PHP array. All data comes into the Controller in a single variable, the $_POST array, and this array can be passed directly into the Model object, and subsequently the DAO, without having to unpack it. This eliminates the need to have code which specifies column names as the code would have to be different for each table. 15 Each column must be passed as a separate argument on any method call, as shown in Table Data Gateway. NO! This would create tight coupling as any change in the number of columns in a table would cause a change to the method signature which in turn would affect any object using that signature. It would also prevent the passing in (or out) of any columns which did not actually exist in that table. 16 Each table object can only deal with a single row. NO! Relational databases operate on data in rows, not individual columns, and the code inside a class can deal with multiple rows as well as multiple columns. Forcing each Model class to deal with a single row, as described in Row Data Gateway, would require extra code in the Controller to instantiate a separate instance for each row, and as a follower of the KISS principle I choose to implement the simplest solution, which happens to be the Table Data Gateway. 17 If data needs to be transferred from one object to another it must be done using a Data Transfer Object (DTO). NO! A database query can return any number of rows, and these rows can be stored in a plain PHP array. This can be multi-dimensional in that the first level is indexed by row, and each row contains an associative array of name=value pairs. Arrays can be passed around just as easy as objects, and they require less overhead to create and populate. Even Martin Fowler does not think that this is a good idea, as explained in his article LocalDTO. 18 Model objects should only hold data, while all business logic should be handled by objects in a separate service layer. NO! This is because my definition of a service is completely different. Logic which is specific to a particular entity should always be encapsulated in that entity's class. Only that logic which can be applied to any entity within the application is eligible for placement within a service. In my framework I have Models, Views, Controllers and Data Access Objects. Each Model encapsulates the business rules for a single database table. All the Views, Controllers and Data Access Objects are services because they can execute their logic on any Model. 19 Use an Object Relational Mapper (ORM). NO! This is supposed to be a cure for the problem called Object-relational impedance mismatch which is caused by having the in-memory structure of an application completely out of sync with the actual database structure. Instead of masking the symptoms of the problem I prefer to eliminate the problem altogether by removing the mismatch. By designing the database first, then ignoring OOD and creating a separate class for each database table the problem simply goes away, which means that I don't need that abomination of a solution. 20 Objects should not be aware of the database structure. NO! Some part of the code somewhere MUST have knowledge of the database structure otherwise it would be physically impossible to construct the SQL queries which move data in and out of that structure. These queries must contain actual table and column names, and must contain values which conform to each column's data type. In my framework, which consists of Models, Views, Controllers and Data Access Objects, the only logical place is within the Models as these are the only components which are allowed to have knowledge of the application. All Views, Controllers and DAOs are application-agnostic sharable services which are built into the framework. All data validation, which verifies that the user-supplied value for a column matches that column's specifications, is performed within the Model, so it follows that the Model must have a list of column names and their specifications. Model classes are generated by the framework using information obtained directly from the database schema. Because each of these classes "is-a" database table it inherits a vast amount of common code from an abstract table class. The amount of code in this class is so vast that my critics claim that I must have created a "God" class that does everything. By citing the number of methods they prove nothing except that they can count. View objects are supplied within the framework and do not need to be touched by the application developer. There is one object for HTML output one for CSV and another for PDF. These can be reused by any component in the application that requires output in that format. Controllers are supplied within the framework and do not need to be touched by the application developer. There is a separate object for each of my Transaction Patterns. These can be reused by any component in the application that is based on that pattern. DAOs are supplied within the framework and do not need to be touched by the application developer. There is one for each supported DBMS - MySQL, PostgreSQL, Oracle and SQL Server. Using my framework I can create a table in the database, generate the table class, then generate and run a family of forms to maintain that database table without having to write a single line of code - no PHP, no HTML no SQL. Unless you can match that level of productivity I suggest you re-examine and refactor your own methodology. In 2004 this post identified a study that broke down an application's code into several basic categories - business logic, glue code, user interface code and database code - and highlighted the fact that it is only business logic which has any real value to the company. It compared the productivity of two different teams and found that the team which spends less time writing glue code, user interface code and database code can spend more time writing the "value" code and therefore be more productive. My framework follows this idea simply because it maximises the amount of time that developers spend on the important business logic. Now ask yourself a simple question - if I can break all of those "rules" and still produce cost-effective software then do those rules have any actual value? Not only does breaking those rules not have a detrimental effect, I submit that my implementation has a beneficial effect because I can produce effective software quicker and therefore cheaper. Producing cost-effective software is the name of the game, not following a set of artificial and arbitrary rules. #1: I have been told that my abstract class must surely be breaking the Single Responsibility Principle for no reason other than it has 9000+ lines of code and 120+ methods. Different people suggest different maximum values. If you read When is a class too big? you will see such values as 7, 10, 20 or more being quoted as the limit. The paper titled A large-scale empirical study of practitioners' use of object-oriented concepts suggests other values. If you actually read the Single Responsibility Principle you will see that it advocates the separation of User Interface logic, Business logic and Data Access logic which is precisely what I have done by virtue of the fact that I have implemented a mixture of the 3-Tier Architecture and the Model-View-Controller design pattern. My abstract table class does not contain any UI logic, Controller logic or Data Access logic, so I cannot see any justification for saying that it "breaks" SRP. Each concrete class identifies exactly which database table is being accessed as well as containing methods which supplement or replace the default behaviour. Each concrete class is responsible for the business rules associated with a single database table, so why does that not follow the Single Responsibility Principle?